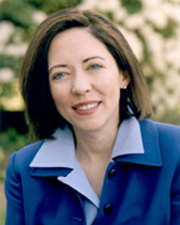 CANTWELL, Maria E., a Senator and a Representative from Washington; born in Indianapolis, Ind., October 13, 1958; attended public schools in Indianapolis; B.A., Miami University of Ohio 1980; pursued an academic course at the Miami University European Center, Luxembourg; public relations consultant; Washington State representative 1987-1993; elected as a Democrat to the 103rd Congress (January 3, 1993-January 3, 1995); unsuccessful candidate for reelection to the 104th Congress; elected as a Democrat to the U.S. Senate on November 7, 2000, for the term commencing January 3, 2001; reelected in 2006, 2012, and again in 2018 for the term ending January 3, 2025; chair, Committee on Indian Affairs (One Hundred Thirteenth Congress [January 3, 2013-February 12, 2014]), Committee on Small Business and Entrepreneurship (One Hundred Thirteenth Congress [February 12, 2014-January 3, 2015]). "Maria E. Cantwell," in Women in Congress, 1917-2006. Prepared under the direction of the Committee on House Administration by the Office of History & Preservation, U.S. House of Representatives. Washington, D.C.: Government Printing Office, 2006.